After a ridiculous dry spell, I finally wrote a wee 200 word flash fiction for Rebecca Postupak’s Flash Friday. 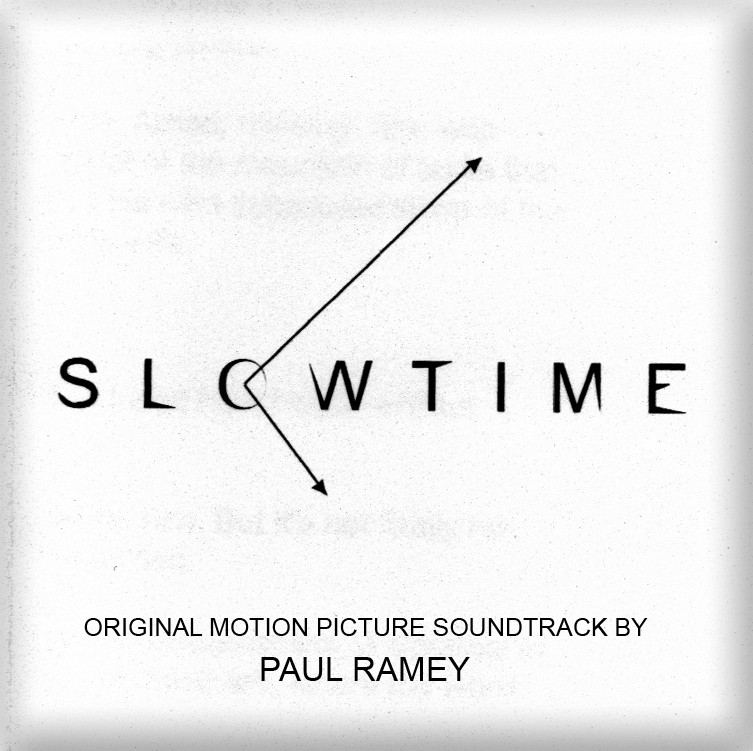 This is yet another Slowtime episode, the serial that I am writing out of order, based on Paul Ramey’s Soundtrack Without a Movie, Slowtime. And here is the photo we had to use for inspiration. Lots of great entries over there – you should check it out! 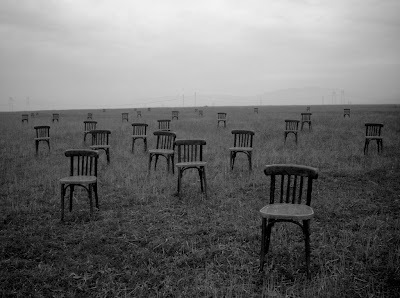 Enu never liked going there, but Elaida was fascinated with the chairyard. 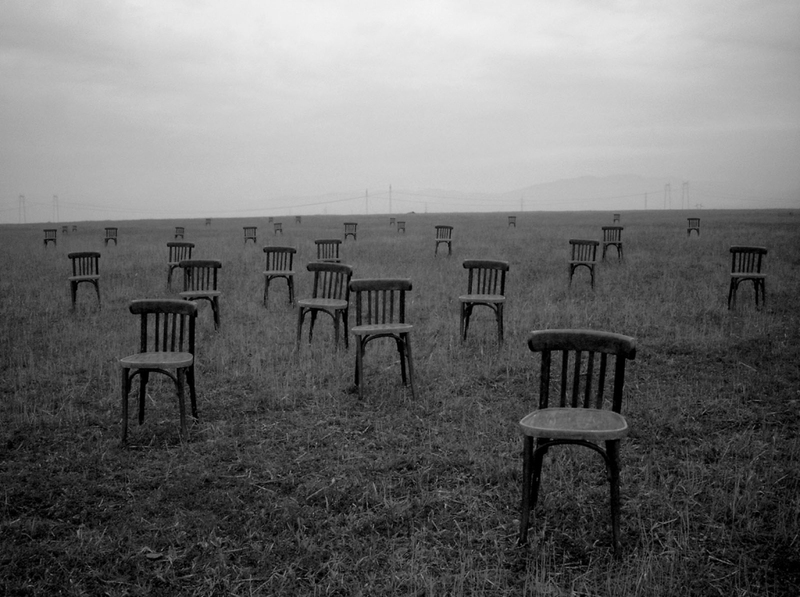 She’d wander through the field for hours, trailing her hand over their weathered backs. Choosing one, she’d perch on the creaky seat, blue eyes slightly unfocused. She turned blind-eyed and then smiled. The moment was gone. Chiled, Enu stood, his feet smudging into the soft ground. “What good does that do?” His voice was sharper than he wanted. In the distance, dead wires hung from their poles. Enu usually thought of them as benevolent overseers, gently sagging. Today, in the lowering fog, they were endless chains, hemming them in. The fog closed around them, listening. Far away, the bell tolled, summoning them to Sleep. 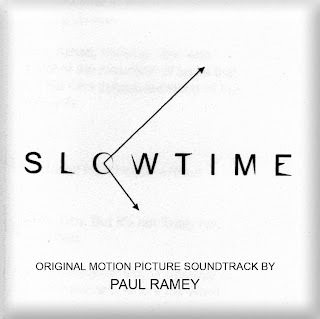 Want to read more Slowtime? So after last night, I had to sleep on my feelings about the season finale of Downton Abbey. I called my mother this evening and we spent 58 minutes howling at the moon…that is to say, dissecting what exactly troubled us about the finale and season 3 of Downton. I should start by saying that I came to the Downton fold most reluctantly (see: Dratted Downton Abbey). I actually missed all of Season 1 when it aired and only started on Episode 1 of Season 2, so I saw it all backwards. I watched all of 2 and then returned to 1, devouring it whole. I loved it, the sparkly wit, the airy Edwardian costumes, Highclere Castle, loved it, loved it, loved it. I waited for the premiere of Season 3 with all the fervent passion of a girl waiting for her first dance. With the Earl’s foolish investments, the way of life at Downton is at risk. 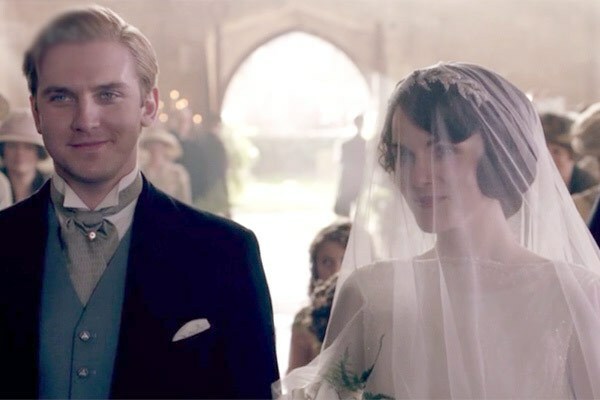 The wedding of Mary was a lovely bright spot (if a bit scanty on the actual ceremony) and it seems like they’re destined for true happiness, especially once he agrees to save Downton. Matthew seems a bit overly tortured by his conscience and perhaps a touch whiny, but it all ends well. There was much made of Shirley MacLaine’s turn as Cora’s mother. I thought it worked okay, but her actual part was completely disproportionate to the fuss made over her appearance in the show’s promotions. She was only in the one episode. I was sort of uneasy about how this season was unfolding. Mrs. Hughes may have cancer, the family may have to leave their home, Tom dumps a pregnant Sybil in Ireland. Bates is in jail, the indomitable Anna campaigns to get him released, but all the scenes with him seem lifted from a different show entirely. Edith gets the short end of the stick AGAIN as she is jilted at the altar. Can’t this girl get a break? The death of Sybil was a shocker, but I thought perfectly believable given the mortality rates of giving birth. But because that’s one of the first big plot events, it means that everyone spends so much time crying and fighting amongst themselves and blaming each other and suffering. It’s realistic, yes, but not so easy to watch. It’s also slicker and more soap-operaish. I mean, we should all acknowledge at this point that it IS a soap opera, no matter how gorgeously packaged. But do they have to keep reminding us? I was relieved at the end of the next to the last episode things seemed to be looking up: Cora and the Earl have reconciled, Thomas isn’t arrested, Matthew’s redeemed himself and everyone plays a rousing match of cricket! Then comes this screeching halt of a finale. First, I think I’ll dwell on the good, because there was rather large scoopfuls of it. The jaunt to Duneagle allows for some of the most jaw-droppingly gorgeous shots of the Scottish countryside. It was hard not to hop online and book a plane ticket to just casually drop in on my brother, who is living there right now. The scenes with Bates and Anna continue to charm, as their relationship develops. The moment where she starts dancing the reel for him was easily one of the most “Awww” moments of the season. Seeing Cora and Robert truly appreciate each other, in the face of the bitter relationship of their friends. The sweet and awkward endearments of Dr. Clarkson to Cousin Isobel. Mrs. Patmore’s jaunt with the gentleman who squires her about, only to find out he only wants her for her cooking talents. Carson jollying about with Baby Sybil. SO sweet, when you recall that he must’ve done the same with her mother. Molesley’s reel. No further need be said. The whole family dynamic of Shrimpy and Co. was tough to stomach. Jaded, bitter husband, jagged, bitter wife and hopelessly sulky daughter a frothy comedy do not make. 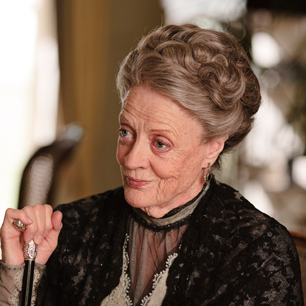 The fact that spoiled Rose is coming to Downton next season makes me groan. Her character was completely uninteresting to me, the “spunky flapper” who is coming to show those stodgy Downtonites what’s what. In fact, I was looking forward to them leaving Scotland so I didn’t have to watch her anymore. I despised the “Edna the Sassy Maid” subplot. It felt old and tired and the actress looked and acted way too contemporary for my taste. Mary was mean, without even the wit that made her snark sparkle in the first two seasons. She’s one of my favourite characters, but it was hard to watch her relentlessly slag Edith and snap left and right, only to be cast as Mary the Madonna in the last few harrowing minutes. Speaking of the death of Matthew, was it really necessary to sludge that blood down his face? Bad enough one of the favourite characters was killed off, did our stomachs need to be turned as well? I didn’t find the Jimmy/Thomas reconciliation believable. It was too pat. I have a soft spot for Thomas this season; when he bawls when Sybil died, I started crying too. I didn’t buy that a character who referred to being gay as a crime against nature was instantly transformed to tolerance, merely by Thomas sacrificing himself. But at least it was a lighter moment. The fact that Edith seems poised to offer herself up as a mistress to Mr. Gregson, who offers his recycled Mr. Rochester sob story (which is never confirmed, incidentally), made me want to toss a pillow at the television. Is it believable to toss out all the societal mores, especially for a woman who has been fairly traditional to this point? I hope she gets a break in Season 4 and dumps him. I know Dan Stevens had other jobs to go do, but Downton won’t quite be the same without him at the core. He provided a contrast to the other characters, a quintessential normalcy that is sadly lacking with him gone. What do you think, dear readers? Will you watch Season 4 with the same fervour? Will the loss of Sybil and Matthew cripple Downton? Has it gotten too dark for you? What was your favourite moment? Least favourite? Now is your moment to sound off!